“SOA, Resiliency & Consiliency,” by Stephen DeAngelis, Enterprise Resilience Management Blog, 16 May 2006, http://enterpriseresilienceblog.typepad.com/enterprise_resilience_man/2006/05/the_blogger_wig.html. “Child Labor & Resilient Nations,” by Stephen DeAngelis, Enterprise Resilience Management Blog, 7 September 2006, http://enterpriseresilienceblog.typepad.com/enterprise_resilience_man/2006/09/child_labor_res.html. But why measure? Why not just wax poetically about social OODA loops, revised OODA loops, and other unfalsifiable concepts? Just because those are unscientific concepts, of course, do not make them wrong. that resilience can’t be developed sector by sector. It must be developed holistically, with challenges in each sector attacked simultaneously. Otherwise, advances in one sector are cancelled out by setbacks in others. Both Safranski and Weeks are correct that resilience, strictly defined, refers only to a bouncing back. Unfortunately, I live in the business world where words are used to “sell” not just explain. In Enterra Solution sales pitches we try to make the point that resilience (i.e., bouncing back) is no longer sufficient if organizations want to thrive, not just survive, when faced with emerging 21st century challenges. In business, science, are any progressive enterprise that focuses on development, selling is critical. It is crucial to generate theories and objective facts that can be understood, even without some deeper philosophically harmony between partners. There are times and places for subjective arguments. I’ve lauded subjective perspectives, such as interpretivism and constructivism, on this blog before. Great scientific theories, such as the Wary Cooperator Model, are built from horizontal thinking. Positivism will never explain everything to us, and it may not even explain much that matters to us. When we try to induce meaning from brute facts we may even be deceived. But that does not detract from the insistence that developmental, progressive fields of study need measurement. That’s how we build useful bodies of knowledge. That’s how we create useful fields for engineers, such as resilient software development. Resilience measures the degree of shock needed to cause a perturbation. Agility measures avoidance of perturbation. Resiliency measures recovery from perturbation. Resiliency is the ability to spring back from and successfully adapt to adversity. Resiliency is a function of perturbation and is measured in production-factors and time. That is, the concept of “resiliency” only makes sense in the context of the set-back or disaster. So for example, New Orleans may have had very high resiliency against category four hurricanes, but very little resiliency against Katrina-class hurricanes. Resiliency is a two-dimensional (or co-ordinational) number, with one ordinate measuring time to recovery and the other measuring the amount of labor, capital, and land needed to recover. For instance, say your house burns down and you are cash-rich but uninsured— your resiliency factor may be very good in time but very bad in resources (you can buy a new house in cash, but it will take a significant portion of your resources). Alternatively, take another person who may be cash-poor but well insured. His resiliency would be poor on the time-axis (because he would have to wait for the insurance check to arrive) but very good on the resources side (if the house is insured for replacement value, he may actually earn on the disaster). Green has gone time-resiliency but Red has more resource-resiliency. How can we tell who has more resiliency? A draw-back of a two-dimensional measure of resiliency is that it is hard to say which person would have more or less “resiliency.” Because different people will have different indifferent curves. For instance, under depending on indifferent curves used, each of these people may have greater resiliency! Both Green and Red are on the good side of their private resiliency curves, but how can we tell who has more resiliency? 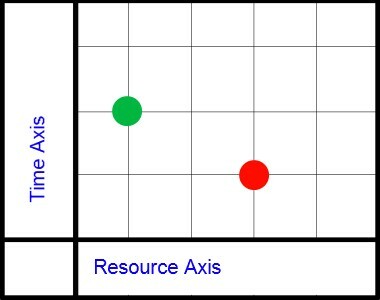 A single, objective measure of resiliency can be gained by determining a resiliency-value along each point from the resource-intercept (which is determined by how much time-resiliency someone has if he has zero resource-resiliency) and the time-intercept (which is determined by how much resource-resiliency someone has if he has zero-time resiliency). Then, take the area, and you have someone’s (or some organization’s) resiliency number. While one’s resiliency preference may be different from another, a researcher can now measures someone’s total resiliency. Similarly, when Enterra CEO Stephen DeAngelis discusses “degrees of resiliency” among Muslim charities, the above definition of resiliency gives us a straight-forward way to objectively compare resiliency among Islamic responders. In the previous post, I measured resilience by the amount of effort required to perturb a system. In this page I will discuss a related element, agility, which is shown by systems that do not experience perturbation in spite of risk factors. For instance, an economy that is extremely dependent to variation in the flow of capital would be a capital-wise non resilient economy. A person who is extremely dependent on nurse for support would be labor-wise a non resilient person. A household that required their home not to be destroyed by a hurricane would be land-wise a non-resilient home. Yet each of these resilience-challenged entities express agility if they continue successful operation in spite of a perturbation. If the economy keeps humming, if the patient stays alive, if the home does flood in spite of storms, all of them demonstrate agility. Agility can thus be seen as a form of power over circumstances. A capital-dependent economy can have agility through contracts or a powerful friends (a pillaging army). A labor-dependent patient can have agility through contracts or powerful friends (mafia buddies). A land-dependent family have have agility through contracts or powerful friends (guys strong enough to lift sandbags). It follows that agility is by nature a social phenomenon that is dependent on the quality of the relationships between an entity and others. A nation suffering an oil-shock that responds by successfully occupying the striking oil fields, however, would demonstrate agility. (Of course, if that nation occupies the oil wells clumsily and stupidly such that the system changes from one state to another, then no agility is demonstrated). To measure agility, we take the minimum amount of capital, land, or labor that is required to enforce the flow or presence of the perturbing fluctuation in capital, land, or labor from the amount possessed. For instance, a house during Katrina would not have agility, because it is impossible to trade labor or capital to make up for the fluctuation in land. We might approximate this from a pattern of responses to perturbations. If a patient has experienced a number of nursing strikes, for instance, but has maintained care for himself, then he has a historic record of agility. 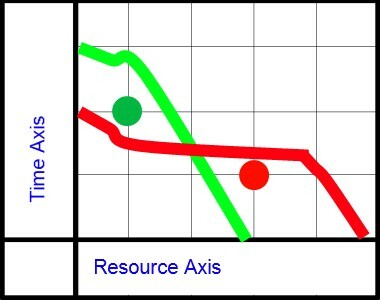 “Factors of Production,” Wikipedia, 14 August 2006, http://en.wikipedia.org/wiki/Factors_of_production. “Resilience,” Wikipedia, 29 August 2006, http://en.wikipedia.org/wiki/Resilience. With Steve’s original post on Singaporean resilience continuing to gain traction (SG Entrepreneurs and China Law Blog have written things not mentioned in my first update), I thought it was time to take a stab at determining what, measurably, is resilience. resilient in Cash, as Singapore has enough to cushion most shocks. These are my first notes for my class on Genetic Politics since I finished the Buller, Pinker, and Ridley. The notes are from an unpublished manuscript, “Audience Effects on Moralistic Punishment,” by Robert Kurzban and two co-authors from the University of Pennsylvania. I previously described Bob Kurzban’s lecture on UNL, and some of that lecture was derived from this study. Resilient organizations cannot afford to be caught up in this vicious circle. The reason that Tom and I promote standards-based development and rule sets in general is because they help mitigate behavior. The World Trade Organization, for example, was established so that a dispassionate group could rule on impassioned trade disputes. Even that doesn’t work all the time. The collapsed Doha Round of talks is clear evidence of that. Everyone recognizes that their collapse is a shameful failure and that the consequences are not likely to be beneficial — but that doesn’t seem to matter. The reason, of course, is that “all politics is local.” Gilbert concludes on the pessimistic note that old hatreds and intolerance still play a large role on the global stage. An advantage of enforced rulesets is that they limit the need for every organization to prove that he is tough enough to protect itself in all ways. Rulesets help end the state of anarchy, which increases Peace and averts destruction of lives and property. Enforced local security rulesets have helped drive the murder rate down a hundred times in the past millennium. Enforced trade rule sets too can save many lives, by preventing countries from having to posture before the anonymous crowd. The rest of this post are quotes from the research article which I may use later for my final project, tentatively entitled System Administrations for Phenotypes.